The motor industry in America is steadily recovering. The competition is large with foreign brands. 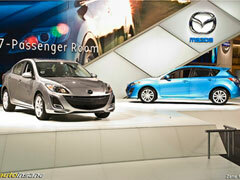 The customers will now have increased choice of all new presentations, local and foreign at the Auto-Show. This year the buyers are also expected to be choosy on the stability of the manufacturer also. The Americans and they would have seen many Company bankruptcies slow recoveries through restructuring plans. Chrysler almost vanished being run by Fiat, while GM is now Government owned. Toyota suffering the biggest loss in 60 years. GM has also discontinued its shaky brands, Pontiac, Saturn and Saab. The manufacturers will have to convince their buyers on the quality standards, after sales services and longer durability of their models. The slow economic activity will not allow a big chunk of Prospective buyers to make purchases time and again if they select of a vulnerable make. The American market will see new cars from China also. The Beijing Automotive deal for Saab assets seems done. Geely Automobile of China is prospecting for Volvo and Ford. The third BYD Auto is introducing its plug-in-hybrid in collaboration with Warren Buffet as an investor partner. All the 3 large American Automakers now stand reduced to almost in level with others include foreign brand makers. New technologies will make way in Auto market introducing new terms like “Lithium-ion Battery” or “plug-in Hybrid”. Will the Tokyo Motor Show Be Cancelled?